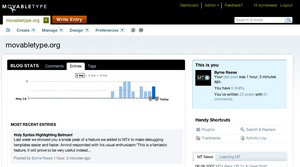 Originally the blog was not called Cool Tools but Recomendo (you can still get to Cool Tools from Recomendo.com). I added only one new tool a week since I wrote most of the reviews. In either a stroke of genius or a stroke of luck I asked anyone who wanted to join the list to submit a cool tool recommendation first. (To join the list now, go here.) These reader-supplied reviews were so good, and so frequent, that I was able to post a review per day. While the reviews are primarily written by reader/users each one was edited, checked, polished, researched, packaged and designed by me. When it worked, none of that effort was visible. As the site’s traffic grew the name Recomendo was needing too much explanation so after a few months I changed it to Cool Tools. 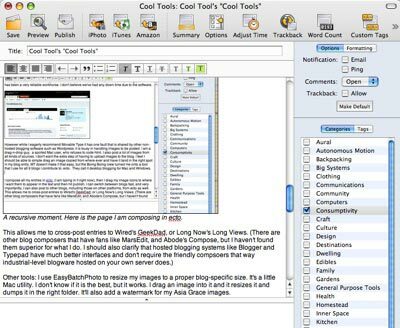 Now that Cool Tools is five years old, it is ready for its next stage. In a month or so I will be turning on a redesign of the site. The idea is to acknowledge the community of readers who have developed Cool Tools, and in the spirit of the times, harness more of that collective wisdom. So version 2.0 will have member’s comments, discussions, and more direct means of feedback. It will look a little different, too. I am very leery of messing up something that works, but change is your friend. There is a lot more traffic to the site, so just to keep up with that load requires new tools. This is a readership that is larger than Wired when we first started it, and 10 times as large as CoEvolution Quarterly and the Whole Earth Review at their peaks. And Cool Tools is run by three part-timers, instead of a staff numbered in the scores. To do that it uses a lot of cool tools. What follows is the kit of webtools that powers Cool Tools. You could think of it as Cool Tools’ cool tools. This is the stuff we use everyday to make the site run. As we like to remind readers, if you know of something better, please let us know. From day one, Cool Tools has run on Movable Type. MT has handled this traffic easily. We recently upgraded to version 4.0. We also have installed Movable Type’s new Community Pack, which will provide the community functions such as member profiles, forum areas, ratings, etc. MT has been a very reliable workhorse. I don’t believe we’ve had any down time due to the software. However while I eagerly recommend Movable Type it has one fault that is shared by other non-hosted blogging software such as WordPress: it is lousy in handling images to be posted. I am a drag-n-drop guy, a spoiled Mac user, who refuses to code HTML. I also post a lot of images from all kinds of sources. I don’t want the extra step of having to upload images to the blog. I feel I should be able to simply drag an image copied from wherever and have it land in the right spot in my blog entry. MT doesn’t make it that easy, but the Boing Boing crew turned me onto a tool that I use for all 9 blogs I contribute to: ecto. They call it desktop blogging for Mac and Windows. I compose all my entries in ecto, (I am typing in it right now), then I drag my image icons to where I want them to appear in the text and then hit publish. I can switch between blogs fast, and very importantly, I can also post to other blogs, including those on other platforms, from ecto as well. A recursive moment. Here is the page I am composing in ecto. WYSIWYG. Other tools: I use EasyBatchPhoto to resize my images to a proper blog-specific size. It’s a little Mac utility. I don’t know if it is the best, but it works. I drag an image into it and it resizes it and dumps it in the right folder. It’ll also add a watermark for my Asia Grace images. For outbound RSS feeds we use Feedburner. It has a pleasant management interface, and gives me handy stats about readership and what items are read. It has a lot of other tools, which we don’t use out of laziness. Half of Cool Tool’s income comes from ads, as served up by Google Adsense and FM’s ad network. The other half comes from Amazon purchases. We are enrolled in Amazon’s Affiliate program. That means that when a reader clicks on a red link to Amazon, and actually purchases the item, Cool Tools gets 8% of the purchase price. We don’t have an affiliate relationship with other vendors, except Netflix. But Amazon’s deal is interesting because Cool Tools will get a fractional cut of any thing else a reader purchases on a visit initiated by a link in Cool Tools, whether or not they purchase the linked item. If you go to Amazon to check out a pair of tweezers listed in Cool Tools but end up buying a $24,000 tractor for the backyard, we get a fraction of the tractor purchase. Cool Tools and all KK* blogs are hosted by WestHost, who are headquartered in Utah. Over the years we’ve outgrown the small-time web hosters we once used. Because of our traffic is hefty enough we have our own dedicated dual processor machine at WestHost, although they offer many options for lower traffic sites. Their minimum package starts at $4/ month. We are happy with them. Prices are reasonable, downtime negligible and service excellent. They claim 99.9% uptime and that matches our experience. We can reach a capable human on the phone or via chat any time 24/7 almost instantly. We also run our mail through them, and they also handle our domain registrations. And they include AWStats for monitoring traffic. For web stats that we really think about, that is, for keeping track of the number of visitors, what is being read, and all that, we use Google Analytics. This is a wonderful free service. There is so much power and depth in this tool, and Google Analytic’s interface is so elegant that one could mine it full time. You get what the web has always promised publishers — an exact picture of how your content is used. But frankly, I hardly delve into it because I am not really trying to optimize traffic. (I am trying to optimize usefulness of the content.) I dip into once or twice year just to see what’s going on. Sign up is quick and painless. You simply need to insert an invisible pixel on all your pages. Google Analytic’s results for Cool Tools. I need to search Cool Tools all the time. I am constantly trying to find a tool in the archive, or researching similar past tools. The standard blog search function included in Movable Type was pretty spotty and never worked very well. We’ve found that Google’s search of Cool Tool pages was far more responsive and practical. So now we use another fantastic service from Google, Google Custom Search. Google offers this as a free custom search box which you can install on your blog. This tool will provide readers with very fast, excellent search results of just your blog. You can install a free dedicated search for as many blogs or sub-groupings of pages as you wish. (In fact you can gin up your own “search engine’ for any set of websites you want.) The free version of Custom Search displays Google branding and ads and has limited design possibilities. We use a pro (paid) version on most of the KK* blogs (but not Cool Tools yet) which removes the ad and allows us to style the results in line with the rest of the site’s design. 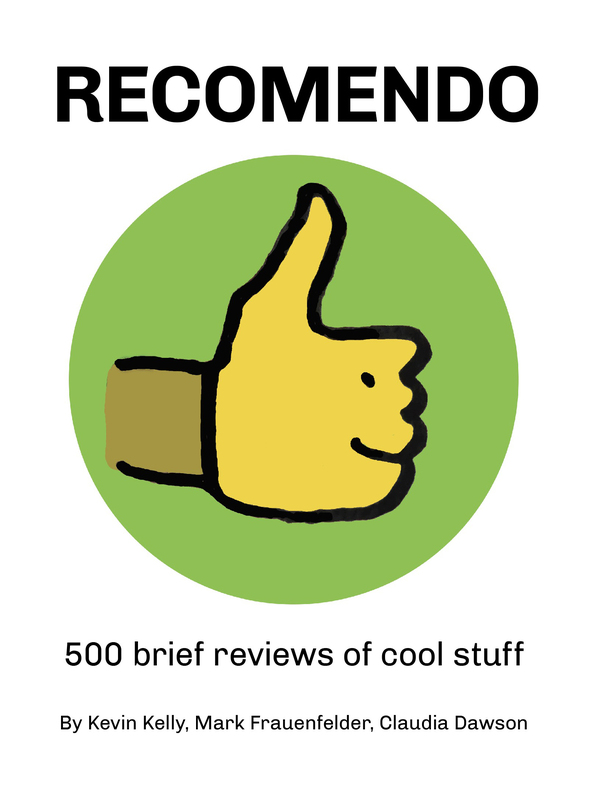 I still maintain the original Cool Tools email list. Members of the list get a weekly email with the 5 cool tools that week before they are posted on the website (usually). To get on the list you sign up here and provide a cool tool you love. I’ve been using a bare-bones email list manager called Minimalist. It really is minimal. You can only interact with it via email (!! ), it is currently unsupported, and it was written eons ago. But it was free and worked. However lately we’ve had a few hiccups with it, so we will be moving onto a new mail list program, Dada Mail.